Finding the Lord at the Post Office! LIKE YOU, I always find religious tracts at the post office when I go there to check my mail. 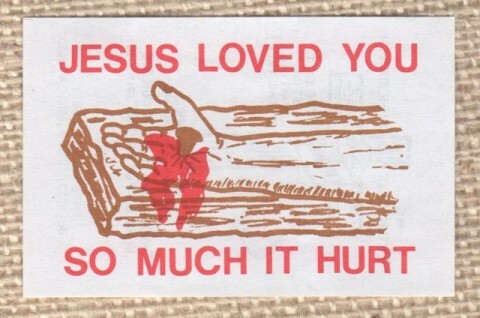 A bit of a play on an old idiom, “JESUS LOVED YOU SO MUCH IT HURT,” it reads, with His hand impaled to the cross with a garish splash of blood where the spike’s been driven through. If they were going for shock value, it got my attention, even living as I do in our so-called “advanced” society where violence – in movies, in video games, on TV and in real life – is so disturbingly commonplace. I called up the number on the back of the tract and told the man who answered that its graphic message had intrigued me. I wanted answers. Posted by Ted on October 28, 2013, 6:00 AM.